I was born in 1975 and grew up in Hiroshima Prefecture. I have always loved cooking and decided to enter the culinary path as soon as I graduated High School. Back in those days, I remember leaving the dormitory at 5 a.m. to go to the fish market to learn from fishmongers. After my training at the famous “Kenzan”, at the age of 30 I decided to open my own restaurant. For the 10th anniversary, we moved the restaurant to our current location and for the anniversary party and I was honored to have Mr. Ishikawa of the celebrated Michelin two star sushi restaurant “Harasho”, and also Mr. Kitagawa of the renowned Michelin 1 star Japanese Cuisine restaurant “Oimatsu Kitagawa” stand behind the table with me. I believe the most important thing for a sushi restaurant is to love making sushi. 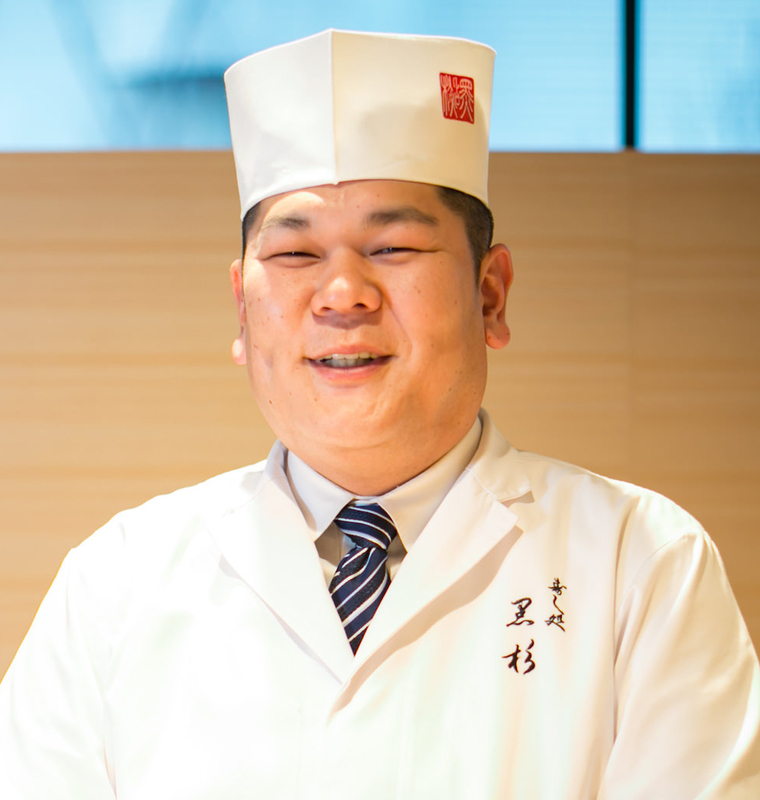 I wish to expand abroad and continue to have sushi restaurants that provide customers with satisfaction. Kurosugi has a comfortable minimalistic stress-free ambience. 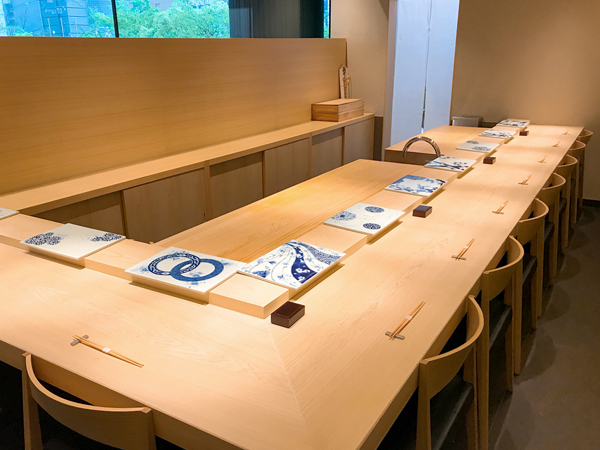 A sophisticated modern interior with the traditional counter experience, Kurosugi has seats at a hinoki counter (10 seats) available for reservation and a private room with an L-shaped counter (6 seats) that is available for reservation for private use. All dishes are prepared and artfully presented on beautiful hand-painted tiles. After multiple individual dishes are presented, nigiri sushi is served. All of the courses are “omakase”. Based on the price of the course, the variety of the sushi and the number of food served will vary. All of the ingredients are purchased in Japan, and are safe, seasonal, and fresh. 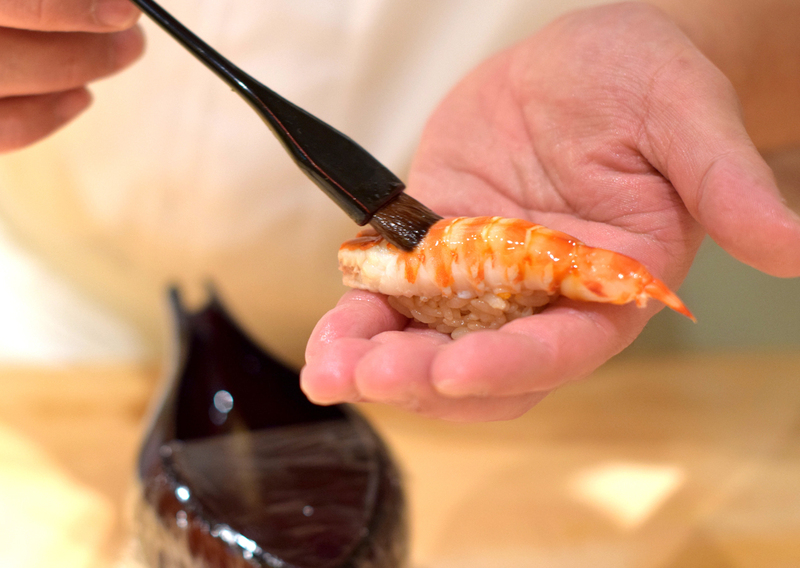 Although the fish for the sushi changes daily based on procurement, choice Hinohikari rice is used for the sushi which is purposely cooked on the firm side to create sushi rice that releases its sweet flavor the more you chew. A wide selection of wine and Japanese sake is available and a sommelier is ready to provide some suggestions for drinks that are ideal for your food. As a general rule, we kindly ask that adults not bring children, but if a child must accompany a parent, please note that the child must be 7 years or older and is required to order a course (there is no children’s menu and only courses for adults are served) .